Welcome to Mahana 405! This beautiful oceanfront condo on North Kaanapali beach sleeps 2-4 and features a convenient second bathroom. 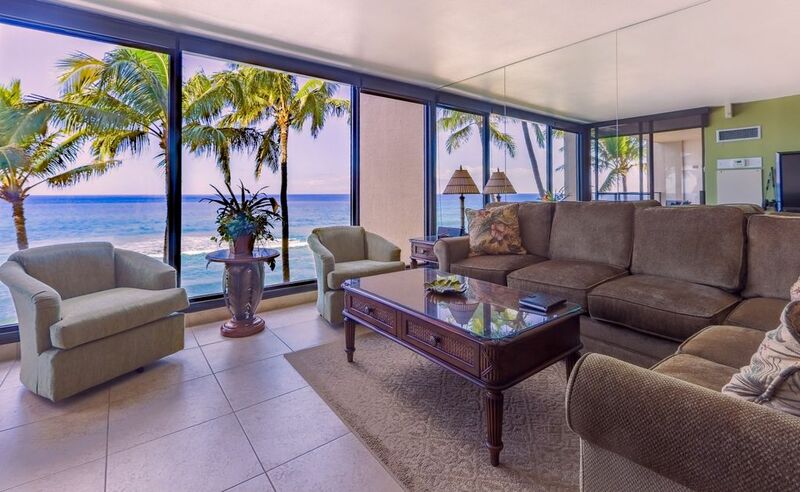 Enjoy stunning views of the ocean, beach and outer islands from the living room, dining area, bedroom, and lanai. Living room highlights include tile floors, 55" Smart HD TV (access your Netflix and Hulu accounts), blu-ray DVD player, and brand new sectional with queen sofa bed. The bedroom boasts a 37" HD TV, DVD player, ceiling fan, and plush CA king mattress. The kitchen has granite counter tops with new stainless steel appliances and both bathrooms include granite counters with large walk-in showers. This unit also includes a workspace with free Wi-Fi and printer. Additional extras include central air-conditioning, washer dryer, free long distance to US and Canada, as well as no resort fees or parking fees. The Mahana property is centrally located - close to shopping, dining, snorkeling, and golf. • Within walking distance to groceries, take-out, beach restaurants, DVD rentals, and dive shop. • New boardwalk is perfect for jogging or walking - starts at Mahana continues to Black Rock, Whaler’s Village and beyond. Chase ‘N Rainbows (CNR) Real Estate, Inc. is a Maui-based, family-owned company established in 1980 with two divisions: vacation rental management and real estate sales. For the past twenty years, CNR has been offering visitors and Kama’aina alike, affordable and luxury accommodations at a very competitive price. All of its vacation rental units are carefully selected, meticulously inspected, attractively furnished and well maintained to the highest standards. CNR is committed to providing the finest product and unsurpassed personalized service in the industry. These condominiums come highly recommended by leisure, business, and family travelers with distinctive tastes. A significant number of satisfied, return guests speak for the company’s service commitment and quality product. Chase ‘N Rainbows is a proud member of the Hawaii Visitors & Convention Bureau (HVCB), The American Society of Travel Agents (ASTA), Maui Visitors Bureau (MVB), Hawaii Association of Realtors, Maui Chamber of Commerce, and Vacation Rental Managers Association (VRMA). Consistently voted the #1 island in the world, Maui has endless activties for vacationers, from fabulous beaches to fantastic dining and nightlife! Located on the northwest side of the island, Lahaina is a tropical paradise blending a rich history with modern Maui. Chase’ N Rainbows Real Estate offers you the finest collection of hand-picked Maui condo rentals in the popular areas of West Maui. We've have a wide variety, including affordable and luxury condo units, in and around Lahaina, Ka'anapali, Kahana and Napili . Each vacation rental property is professionally managed and superbly maintained to the highest standards. Offering views of the beautiful West Maui Mountains and across the pristine islands of Lanai and Molokai, our rentals range in size from cozy studios to spacious 3-bedrooms which come fully furnished and equipped for your vacation. Bed linens, bath towels, hand towels and wash clothes are provided. Beach towels available for rent at $4/each + tax per stay. Blu-Ray DVD player in living room, DVD in bedroom. Come see all that Maui has to offer! A sunset cruise around the island makes for a perfect romantic evening. If you’re curious about what goes on under the waves, snorkeling tours are a great way to view the incredible variety of life that lives under the surface of the ocean. If you don’t want to get wet, there’s even a submarine that can take you into the deeps while you view its mysteries from the comfort of a climate controlled cabin. Helicopter tours are an excellent way to take in views of the whole island, including incredible waterfalls, sea cliffs and forests you would be hard pressed to view on foot. For those looking for a little more excitement, you can take an ATV tour or Zipline adventure, drive the road to beautiful Hana or watch the sunrise from Haleakala. Enjoy Maui's fabulous luaus, restaurants, shops, art galleries and spas! Check out The Snorkel Store for activities and beach equipment rentals. Perfect accommodations with everything we needed. Wonderful Relaxing Vacation at a Premier Condo! This is a well appointed condo right on the beach, with everything you need. You simply can't get any closer to the beach. Very quiet and the most beautiful views. a short walk on the beach is excellent swimming and snorkeling. This condo also has Tommy Bahama Beach Chairs, Snorkeling equipment for 2, and 2 boogie boards. Excellent beach location, very clean and comfortable...this place is lacking nothing. Easy to work with owners. You won’t be at all disappointed. Aloha Michael: Thank you so much for the time you took to post and write this review. The owners of this condo Mahana #405 also own Mahana units #617 -VRBO #458911, #813 VRBO #916854, #1106 VRBO #759755 & #1107 VRBO #558484 which are all equally as impeccably managed and furnished by Chase 'N Rainbows team. The only thing missing was the coffee and snack area that was advertised when we booked our stay. Best unit out of the 6 times I have stayed at the Mahana. Very nice unit. Extremely comfortable. Great value...that's why I keep coming back. Can't beat the view or location. The unit at Mahana was exactly as pictured. We had a wonderful time and hated to leave. We do wish there had been more walking beach in front of the complex as that was what it looked like in the photo's - so maybe this was a "time of year" difference. The unit was very comfortable and had all the amenities we needed. Looking to enjoy some activities on Maui while you’re here? We are partnered with the #1 activity booking company in Hawaii. They have been in business for over 30 years and have a selection of over 2,000 different activities. Not only are they local, experienced professionals that can help you decide what to book, they also have an extremely comprehensive website that includes information, pictures and even video tours of certain activities that can help you decide which activity is best for you. Making bookings using this service will provide a substantial discount compared with booking your activities directly with an activity vendor.